So, on we go. Even though this is pretty straightforward you need a bit of equipment to get it right. The basic equipment is glue – quality wood-glue, as sold by Ponal. The secondmost important thing is probaby some kind of grinder/sander, as you would go crazy doing all this by hand. Next would be a router (no, not the computer thingy but the power-tool…) and/or jigsaw… but more of that later. 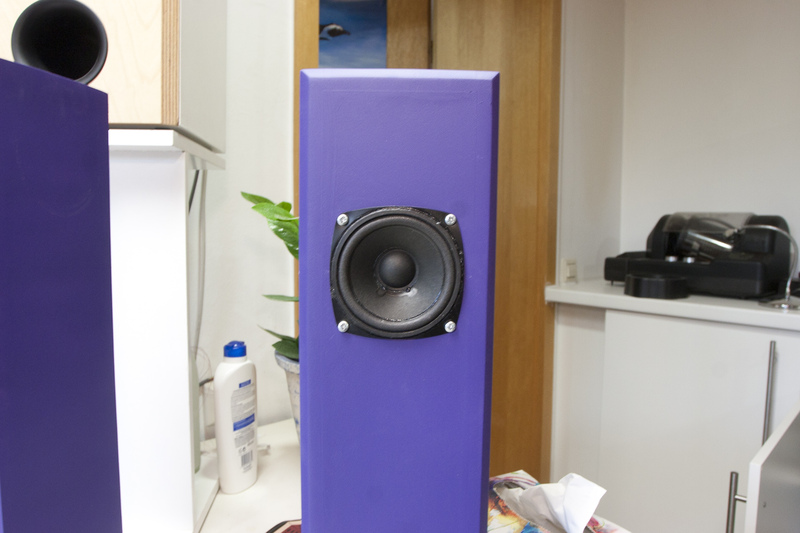 THIS IS NOT A HOWTO – IT IS A DOCUMENTATION ON HOW I BUILT THESE SPEAKERS. I AM NO EXPERT AND THIS IS NOT A ADVISE ON HOW YOU SHOULD DO IT. I MAY HAVE DONE SEVERAL THINGS WRONG/SUBOPTIMAL! Okay, now for some glueing action. Then drilled the holes for the connectors on the backside. even if it's not so important here we made sure we have a tight fit so we need to screw them in using force - again to avoid leaks. After some deliberate sanding using a eccentric sander ... this emerged! smooth as a babies ... well, whatever is smooth on a baby! there *are* marks, okay, but ... its only a 10eur speaker and ... firsttimer, remember? Final product looks okay on the desk! So – the final product seems okay, and for less than two days of work (not fulltime!) its a really nice speaker. It certainly lived up to my expectations of how good a 10eur (actually more 16-17eur) speaker can sound, and its hell better than most pc speakers you can buy out there for maybe as much as 30-40eur. Its – at least in my opinion – worth the time and effort – even if only to learn something, and have tried something new. This project is – for me – a base to build upon – as in that i want to build more and more sophisticated speakers with better craftsmenship, so this is just a start. I hope you maybe drawn into Speakerbuilding yourself as it is a vast and interesting hobby – and you can start off with almost nothing still getting excellent results – especially if you’re not into looks it gets way easier :).